"Made picked us both up from the airport with a sign, and also gave us bottled water. it was a really lovely gesture. and on the drive back to the hostel, we became acquainted with his humour: cheeky and very relaxed, which was great. coming from Australia, where self-deprecation is rampant, interacting with our hosts easily was important because it is our make-shift home while we are here." Mingle with Balinese people, learn their way of life, learn their language, cooking and daily life in a traditional village with a fresh atmosphere. we dedicated this program tohelp in improving our village community knowledge and exchange of the culture and life style. Beside, you can enjoy the fresh nature in fresh atmosphere in real Balinese village. One of the best things about staying in a homestay is that your money goes directly to local people, which has a positive effect on their lives, and can have a positive effect on the environment. Some communities in Indonesia rely on slash and burn agriculture to survive, and tourism can provide an alternative source of income to reduce the threat of deforestation. Rooms in homestays can vary wildly, but most have simple box mattresses on the floor in a private room and access to a mandi (squat toilet with a small plastic bucket for flushing that you also dip into a basin of water for bucket showers) that's shared with the family living there. While these accommodations might be outside of your comfort zone, you can relax knowing that you�re being taken care of by a local family. Meals are usually included, which is a great way to try out local dishes. Most of the family will probably not speak much English, but don�t worry if you don�t speak Bahasa Indonesia � there is probably a younger relatives who speak good English. Homestays can often help you hire a car and driver, or offer you transportation in between cities or from the airport. They can also organize tours for you or connect you to local tour guides. Escape from madening crowd. Wake up to spectacular sunrises. Feel the refreshing nudge of the gentle breeze. Witness rice terraces unfurling themselves into a vista of pure spectacular splendor. Experience all these, and more, when you immerse yourself completely in a Bali Homesta. Why succumb to other depthless tourist program that offer less of experience ? Our program gives you a unique opportunity you will never experience in urban Bali. Helping the village people while your holiday in Bali and knowing more deeper of balinese culture and its heritage. Stay amongts the family in a village; sharing laugh, tough and also get fun with the local village people in their original environment. Learning more of balinese way of life, traditions, local cuisine and mingle with them in the family. 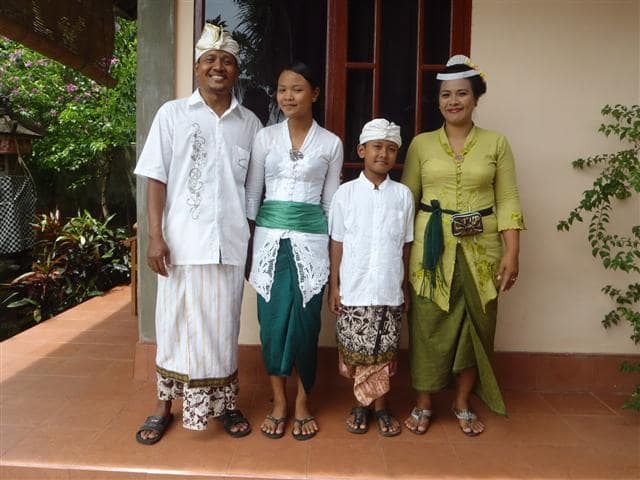 By staying with us in a homestay program, you will blend into daily village people life. On the right season, you can participate with the village people planting rice, harvesting and do some of their daily life in the village. Follow the village community activities and the ceremonies. Visit the temples and do some hiking to southern of the village. Familiarization with children of the village and exchange culture. Evening, familiarization with the family and evaluation of the program. Follow the village community daily activities, learn to make Balinese cuisine, learn Balinese culture and visit the plantations. When staying with families and interacting with locals in general, be aware of any potential etiquette powder kegs by doing a little cultural research before your trip. Dressing modestly is the least you should do to show your respect when staying in someone else's home, and this is especially important when visiting temples and other religious sites (keep a scarf handy to tie around your waist or cover your head). In both Muslim and Hindu culture, using the left hand to eat, touch people and shake hands is considered taboo since it's often used in the bathroom and is considered somewhat befouled. In Bali, be careful not to step on the many offerings placed on the street (particularly new ones that have just been presented to the gods). If you're someone who requires amenities like air conditioning and flat-screen TVs, there's almost no chance you'll find them at a homestay. But if you like the feeling of staying with locals and getting to know them face to face, the homestay experience can be very rewarding. You'll need to let the owners know if you'd like them to cook for you, and you should take advantage of the opportunity to try authentic local foods if they're offered. I stayed with Wayan and Nyoman for 3 days/2 nights and wish I'd booked sooner so I could have done a longer stay. This is a true village homestay experience that you won't find elsewhere in the region or all of Bali (as far as I can tell). 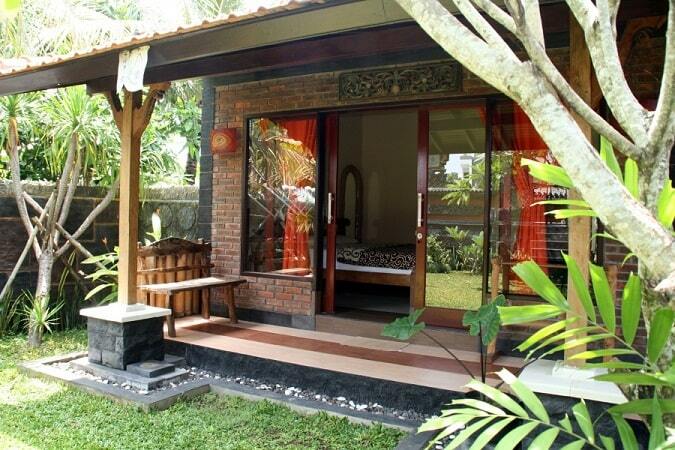 Most other Bali "homestays" are merely B&Bs. I learned so much about Balinese (specifically Tabanan region) culture and life, and really enjoyed getting to know Wayan and Nyoman. This is a unique and special village experience with comfortable accommodations and facilities. As everyone else has said, Nyoman's cooking is excellent. I would love to go back and do one of their longer programs some day.